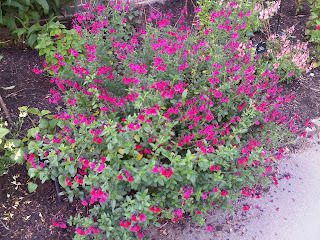 It is salvia time here in London. 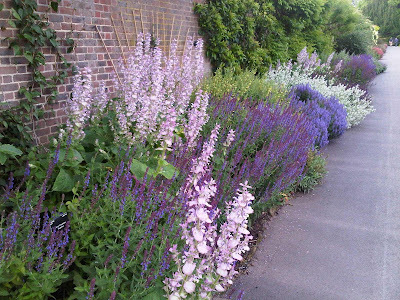 For us botanically minded folk, early summer is about sipping G n Ts (a solution of junipers, quinine, and other plant materials) in the late evening twilight while strolling along a border of flowering salvias. There are almost 1000 different species of Salvia, from the Common Sage, through to garishly coloured species from the Americas, Asia and back through to the Mediterranean. Here in Kew Gardens we grow a lot. Which ones? Take a look at this factsheet. All of them have the distinctive hooded flower that forces the pollinating insect into a position where its back is dusted with pollen. This one has a nice broad lip to land on. Kew not only has a pretty impressive collection of Salvia growing against the wall running along the Alpine Rockery (near the Princess of Wales Conservatory), it does some fancy research on this, the biggest genus in the mint family Lamiaceae. In fact the two are intertwined and the ‘living collection’ has been used to support research into the evolution and classification of Salvia, as well as its chemistry and what we call biological activity. DNA has been extracted from more than 150 individuals as part of this work. 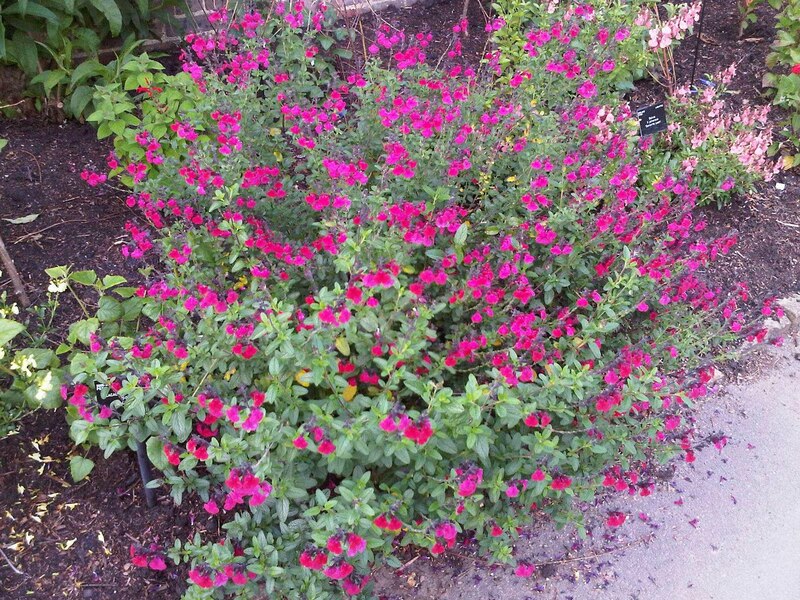 According to our website many species of Salvia are already known to have medicinal properties. Scientists at Kew are comparing the medicinal uses of Salvia from Europe and the New World, with those from Asia and looking for links between their chemistry and uses, as well as their position and relationship in the family tree. Already there are leads in the in the areas of Alzheimer’s, cancer, diabetes and modulation of insect feeding behaviour. This builds on previous work as diverse as Salvia in cosmetics and as a replacement for bear bile in traditional Chinese Medicine. I had no idea that you were at Kew now! I guess that just goes to show how much I've been paying attention lately... Congratulations! 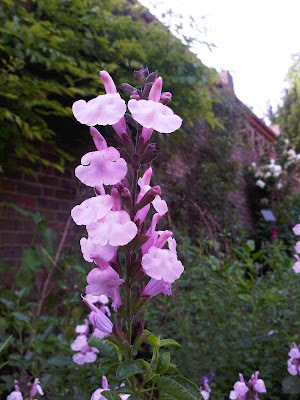 Don't the Salvias look stunning against that lovely warm brick wall. Yes well and truly settled in London now, and lots to discover about UK plants and gardens. Such as how spectacular Salvias are, especially in border along this wall at Kew Gardens! If, as you say Tim, these photos don't do the salvias justice, they must be impressive. The colours are really captivating, and the soft forms so easy on the eye. Just checked this morning, and despite the (welcome) rain they are still looking good. Mostly white, blues and purples but a couple or red and pinkish ones to wake you up! Looks like your plants are totally healthy and truly amazing ! Salvia may be legal but i wouldn't recommend it to anyone because i have seen many at my area who get overdosed with that and do all crazy things ! @Above blogger..... It is no use crying over spilt milk. They look so exited! Thanks for posting the link! 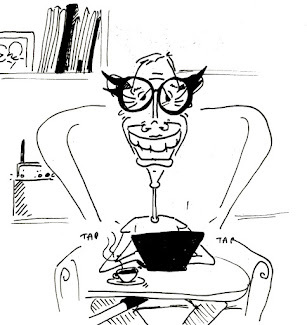 ha ha you've got salvia divinorum sellers hitting your site! I knew they would come on any salvia related articles.